The Realm of Possibility | What is the Meaning & Purpose of Life? Turn on the news on any given day, at any given time, and you’re bound to get a healthy dose of “what you don’t like in this world”. And although virtually every half-hour TV news broadcast will end with an upbeat 2 – 3 minute human interest story, it is often a feckless effort to raise your spirits in relation to the 20 minute summary of abysmally depressing events that transpired that day. And if you don’t have a DVR to zip past the 7 – 8 minutes of commercials, you’re hit with reminders of physical maladies, be it overweight, arthritis or erectile dysfunction, along with inculcations to “speak to your doctor” about a drug you can’t pronounce, which has side effects such as blindness, loss of hearing and possibly sudden death. And that news broadcast did not cover ANY the problems and issues YOU are facing in YOUR world, but in that half-hour, the “news” certainly seemed to make them appear larger and more challenging to overcome. Now before succumbing to an urge to head off to the nearest corner of the room, and curl into a tight fetal position (or God-forbid, something worse), keep in mind your happiness is something very much in YOUR control. A somewhat modified quote by Eleanor Roosevelt expresses this best . . .
“No one can make you feel sad and depressed without your consent“. Now surely managing your emotions is easier said, than done — but I’m also likely not the first person who told you this. And you can dismiss this notion, as you may have done in the past, but I can assure you with 100% certainty that it is true. Go to any self-help guru and you’ll find there are many ways to go about this . . . but they are all, in effect, trying to do the same thing — change your mindset. Notwithstanding, you will surely end up with disappointing results if you don’t believe it is “within the realm of possibility”. If you were to ask someone what the most powerful message was in the movie Pay It Forward, they will likely respond along the lines of “perpetuating selfless good deeds by asking those you help to do likewise for someone else”. But they would be WRONG . . . the correct answer is “The Realm of Possibility” — for it was this concept introduced by an innovative social studies teacher (played by Kevin Spacey) to his 7th-grade class, that instigated one of his students (“Trevor”, played by Haley Joel Osment) to come up with the idea of “paying [goodwill] forward”. 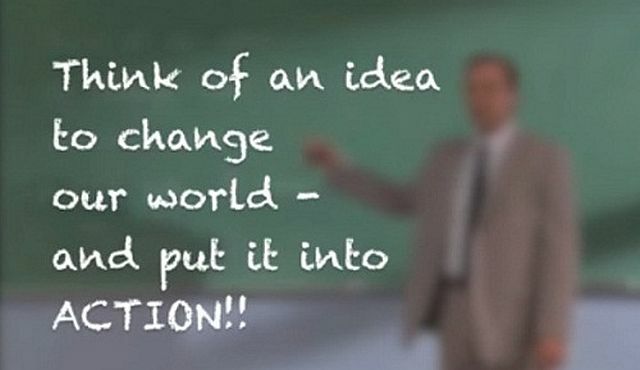 On the classroom board was the year-long assignment: “Think of an idea to change our world — and put it into action.” The realm of possibility is exactly this — a mindset from which perhaps EVERY world-and-life-changing idea or invention grew from. And how large that realm may be is limited only by YOU. So the next time you see something in this world you don’t like . . . DO SOMETHING about it . . . and do so in a MEANINGFUL way . . . for it is within the realm of possibility that YOU can make a difference, and help transform the reporting of “news” into an uplifting experience. And for goodness sake, do it NOW — don’t let YOUR petty little problems get in the way. For in MEANINGFULLY resolving issues that have vexed many others, something magical happens . . . YOUR problems shrink and go away . . . and that long elusive happiness you’ve been striving for, suddenly envelopes your sense of being. Welcome to YOUR world of Self-Actualization. Image | This entry was posted in Being a Leader, Getting Inspired, Thinking Positive & BIG and tagged Helping Others In Need, Inspiration, Leadership, Making a Difference, Realm of Possibility, Thinking Positive & BIG. Bookmark the permalink. Pingback: Don’t Back Down | What is the Meaning & Purpose of Life? Pingback: When You Believe | What is the Meaning & Purpose of Life? Pingback: Kindness Can Be Infectious | What is the Meaning & Purpose of Life? Pingback: Feel Like A Hero . . . | What is the Meaning & Purpose of Life?